William Henry has been in business since 1997. The company name was derived from the names of the original partners, Matthew William Conable and Michael Henry Honack. The brand launched with less than 200 products, all made entirely by Matt, who started making knives at the age of 19, apprenticing for David Boyle in Davenport, CA. Today, the artist/owner runs the William Henry business in its permanent homes since 2004: a 6,400-square-foot shop in McMinnville, Oregon, part of the state’s wine country, while Michael continues to provide business advice and direction. The brand’s products are made in the U.S.A of materials that are sourced worldwide and crafted with honor and dignity. All the artists who work for William Henry share an uncompromising dedication to excellence. 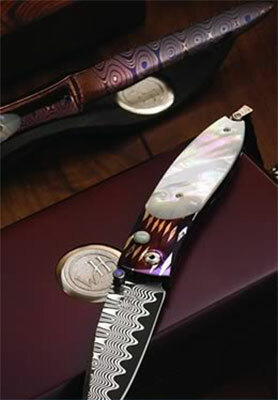 One of the mainstays of the business is pocket knives. Eight diverse collections include Gentac, Kestrel, Lancet, Monarch, Persian, Pikatti, Spearpoint and Vetana. Each knife takes more than seven months to produce, incorporating the work of more than 300 artisans across 800 individual operations. The cutting instruments with unmatched performance can be found in the finest collections worldwide. There are also lines of bold yet refined masculine jewelry, robust and dramatic money clips, key chains, writing instruments and divot tools. All William Henry merchandise is built to the founders’ vision to build the finest tools in the world that seamlessly integrate classic natural materials and state-of-the-at alloys. William Henry products are destined to provide a legacy of exquisite form and function! There are many things that set William Henry apart: Only limited-edition offerings are produced. No two pieces are alike. Pieces come in elegant gift boxes with recommendations for care. You get a lifetime warranty, as the designer stands behind everything it makes. 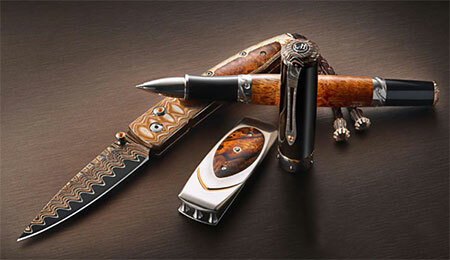 When you buy a pocket knife, piece of jewelry or a men’s accessory from William Henry, you are getting style and substance, art and utility. Take a look and marvel at the natural beauty of quality-crafted William Henry organic pieces today!